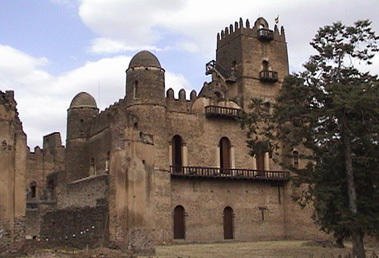 A wealth of other castles, churches and historical buildings are scattered around Gondar. Probably the most charming of these is the bathing pool of Emperor Fasiledas which is used for the colourful annual Timket (Ethiopian Epiphany) celebrations in January. Nearby, is a small domed mausoleum said to have been built for the Emperor?s favourite horse, and ruins of the palace for the redoubtable and beautiful 18th century Empress Mentewab at Kuskuam, which offers visitors an extraordinarily impressive sight and a wonderful view of the town. Within easy reach is the rectangular and stunningly decorated Debre Birhan Selassie Church - one of the most amazing displays of religious art in Ethiopia. Eighty wide-eyed angels look down upon mesmerized visitors and other frescoes depict Christian scenes. Then, just three kilometres from Gondar is, Woleka, the former Felasha (Ethiopian Jewish) village with its highly decorated pottery, which, with all the other sights, offers the visitor an inspiring experience.